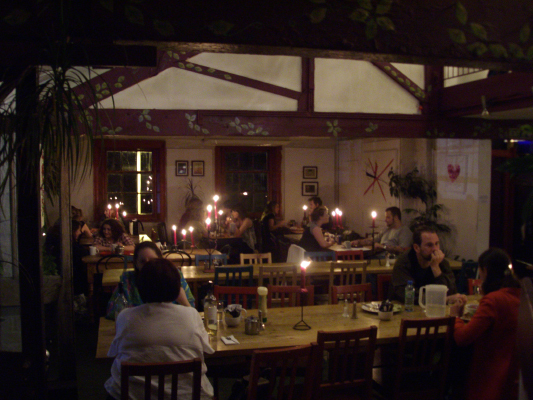 The Egg is one of Liverpool's best kept secrets. Just off Bold Street, if you wind through a side street you'll come across a purple doorway! Follow two flights of winding narrow stairs and you'll come to another narrow doorway. Creep in and you'll be astonished to find an artistic, creative, vegetarian hub. The atmosphere in The Egg is like nowhere else in Liverpool. It's such a fantastic place to chill with a book or a paper, or take advantage of the free Wi-Fi and get some work done. They play great music and they're open every day, but best of all, they're a BYO alcohol venue and only charge £1.00 corkage per bottle of wine. What better a place to relax with friends early in the evening? The early evening ambiance in there is second to none. Beautiful place to relax with friends! Now I'm not a vegetarian myself, but their food just oozes flavour and good health. Although they only have a small choice of mains, they're all delicious. Their homemade soups are great too. As a main, I would go for the 'Tandoori Mushrooms'; they're served with pitas and a yoghurt and mint dip and they're delicious. The prices in this place are fantastic. With mains costing just £4.95, and a wide range of green, normal, fruit and yogi teas at just £1.00 each. They also display local art in a series of ever changing exhibitions, some of which is for sale. If you're visiting Liverpool and fancy something a bit 'far out' and relaxing, I wouldn't hesitate to visit The Egg! Why? An amazing place to chill with friends! Cost: Varied, but cheap for what you get!